A warm welcome awaits you at our award winning, family run Highland Hostel! We have a choice of rooms from twin private bunks to the more sociable 10 bed dorm! We also have twin en suite rooms and the Skyewalker Jedi Huts (Listed as Deluxe Tent on the booking engine). Over 18's only - No children allowed. Please click the 'Show More' button for more info. We're situated on the stunning Minginish peninsula giving easy access to the Cuillin mountain range. It's location on the west coast makes for spectacular sunsets and gives you an ideal base for exploring the beautiful Isle of Skye. The rural location (if you do not have a car please read the public transport section of the directions) means you are surrounded by unspoiled natural beauty. There is a great beach within walking distance with regular sightings of whales, dolphins and basking sharks as well as Skye's famous eagles! The hostel is only a five-minute walk from the local hotel which serves meals and has a cosy bar, very popular both with locals and visitors. The nearest shop is in Carbost and it closes at 17:45. The world famous Talisker distillery is less than 3 miles from the hostel and well worth a visit. Portree, the capital of the Island is only 25 minutes away by car or local bus. The Hostel has a well equipped self catering kitchen and a large garden area for recreation and barbecues. 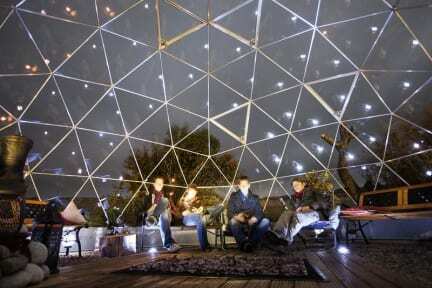 There is also a cool 'chill out' glass dome for guests to relax in. Skyewalker Hostel hosts regular Scottish folk music sessions and has instruments available for guests to use. It is also possible to book the whole place for special occasions such as birthdays, Munro completion parties, family get-togethers etc. We had a wonderful stay here, the amazing staff went above and beyond in every way to help us out. They kept the reception open late for us as we had a flat tyre and wouldn't make it by 9pm, and then when the lovely receptionist discovered we hadn't been able to have dinner she gave us some of her own food so we could eat! On top of this the hostel itself was amazing, beautiful new kitchen and bathrooms, very comfortable beds, plenty of car parking. Will definitely stay here again!! What a rad facility! This family run getaway has such a great atmosphere. There is a bar/restaurant within walking distance and another a 5 min drive away. It is also located very close to the Talisker Distillery. After a good day of trekking around the island, nothing was better than relaxing and stargazing in the skydome located on the grounds. I couldn’t recommend this spot more. We were really satisfied. Fantastic atmosphere, friendly staff, very clean hostels, and brilliant, beautiful, wonderful, enthralling,......(the words don`t come easy) surrounding area. We will recommend our all friends. Thank you!!!! Loved our stay here, so quirky and the kitchen and showers were so new and clean. Great place to stay! Awesome hostel with a great atmosphere and lovely staff. Highly recommended! SkyeWalker Hostel is a delight.Very clean and friendly family run business.Very good facilities.Lovely comfy lounge area.Attached dining area and a well equiped Kitchen and breakfast table.We stayed in the twin rooms in the old school house with it's own toilet and shower.They have musical instruments,guitars and banjos in the lounge area for the evening entertainment which goes well with the Warden's nightly rounds of various alcoholic tipples. Had an awesome stay!! The showers and toilets are nice and spacious. The bedrooms only have one charging point (as far as I noticed). The atmosphere was awesome. The owner is a great guy who is full of awesome recommendations and conversation (also he gives out shots each night it seems). I would definitely stay here again! The staff were friendly, kind, and down to earth. Very personable and truly cared about your stay. The location was perfect for everything that we were doing on Isle of Skye. This hostel was close to The Fairy Pools, Neist Point, the old inn (for food), and a distillery. They had a nice kitchen equipped with anything that you needed. It was clean and we felt safe.